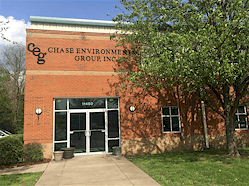 Chase Environmental Group was contracted for the removal and closure of two 20,000-gallon heating oil tanks. Traces of toluene were encountered in the excavation pit upon removal of the heating oil tanks. Subsequent assessment identified extensive subsurface toluene contamination in an area immediately adjacent to the heating oil underground storage tank pit area. A Work Plan was submitted and approved by the Kentucky Superfund Branch for characterization and determination of the extent of toluene-contaminated soil and groundwater. The Work Plan identified cleanup levels for toluene in soil and groundwater based on USEPA Region 9 Preliminary Remediation Goals and Maximum Contaminant Levels and Kentucky Underground Storage Tank (UST) Branch standards for cleanup of toluene in soil from a release from an underground storage tank fuel system. Subsequent removal of toluene-affected soil uncovered a spent solvent recovery piping system that was once connected to a 10,000-gallon underground flow-through tank and a 20,000-gallon storage tank. Review of historical “as-built” plans provided details on the design and construction of the spent solvent recovery system. Residual toluene in the product piping system was removed by vacuum extraction and the accessible piping was removed. The remaining piping that ran under the concrete foundation of an adjoining warehouse was cut-off and closed in-place by filling with concrete. Toluene contamination was subsequently identified in the sandy fill materials of the former toluene underground storage tank pit. Field screening and Geoprobe sampling techniques were utilized to determine the potential extent of subsurface contamination. Approximately 700 cubic yards of toluene contaminated soil and fill materials were removed by excavation for packaging and transportation to a hazardous waste disposal facility. Chase installed twelve temporary monitoring wells in perimeter areas surrounding the waste removal area in order to assess potential toluene contamination in groundwater outside of the excavation pit area. The temporary monitoring wells were sampled for volatile organic compounds. The depth to groundwater was measured in the temporary monitoring wells for determination of groundwater flow direction. No groundwater contamination was identified outside of the waste removal area. The waste removal excavation pit was back-filled with gravel. Toluene-affected pit water was remediated in-situ using a combination of enhanced bioremediation and dual-phase vacuum extraction remedial methods. Cleanup to the adopted cleanup levels for soil and toluene-affected excavation pit water – which was determined to be recharged by groundwater - was achieved within six months of the discovery of the subsurface toluene contamination. Both the Kentucky UST and Superfund Branch issued no further action letters after remediation efforts were completed.